On September 13th, Adam Conover, the man with incredible hair and all the facts, graced the Showbox Market stage. Conover, best known for his truTV show “Adam Ruins Everything,” and YouTube channel CollegeHumor, was in Seattle for the first stop on his Adam Ruins Everything LIVE tour. 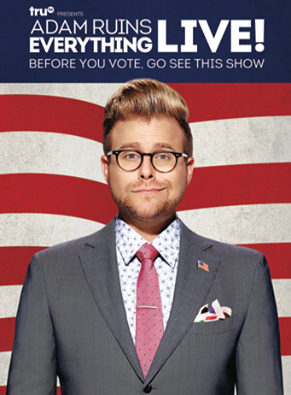 When I entered the venue and saw the projection screen with “Adam Ruins Everthing: Election Special” on it, I was a bit disappointed since this had been the topic of a season one episode. Or so I thought. . . Ten minutes past show time “Democracy” started playing, followed by an off stage Adam greeting us all and introducing show writer/warm-up comic Gonzalo Cordova. A couple solid laughs, some awkward moments, and a fried plantains with cheese breakfast recipe I’m curious to try. A large portion of his material seemed like it was being said for the first time; he took some risks – which is definitely admirable – but I was ready for Adam when his set was over. Conover got on stage and wow, his golden perfectly-styled hair was even more amazing and voluptuous in person. His hair wasn’t the only thing a little different from the show. This was not the season one episode on repeat. This was an in-depth look at the election circus we’re watching. A piece by piece analysis and comparison of this crazy election to various events in our nation’s history. Those events were actually not that far off from what’s happening now. The one difference? They all didn’t happen at the same time. It was fun and, just like the show, an informative evening. Adam conveyed his information in jokes alongside clips from various news outlets (which gave the show an almost Daily Show feel), reenactments, and a few pictures of jokes. His verbal delivery was different from the show. Less G-rated-happy dork-more sassy-know-it-all-who swears like a sailor. He didn’t have hecklers. . . but he did heckle the audience a few times about their reactions (lots of “aw-s” over sad things that happened to Republican Florida Governor, and now former presidential candidate Jeb Bush). Something I hadn’t noticed much in the TV show but was quite obvious live, was how incredibly good at seeming impartial he was. By the end of the night I wanted to know whom he was planning to vote for. Instead, the night ended the same as his show, with an uplifting fact to give us hope for what seems like a dark future. People of opposite political sides actually agree on way more – and more often – than you’d think. Written by: BBS on 11/03/2016.on 11/04/2016. This entry was tagged adam conover, adam ruins everything, monica martinez. Bookmark the permalink.